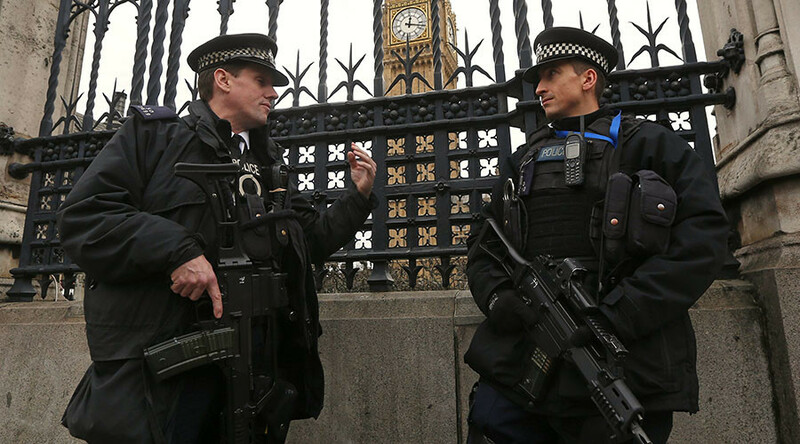 Metropolitan Police officials have announced 600 more firearms officer posts for the British capital in response to November’s terror attacks on Paris, but experts warn London isn’t the only UK city at risk of terrorism. One hundred and thirty people were killed and hundreds more wounded as gunmen and suicide bombers hit targets across Paris in the shocking 2015 attacks. “Whilst I sincerely hope it is something that never happens on our streets, it is only right that the Met are as ready as can be,” Hogan-Howe said. There are currently 2,200 armed officers in London and a third of the proposed 600 will be on standby at any one time. Under the new measures armed patrols will double, with just under 10 percent of the Met’s 32,000 officers being firearms trained. “My firearms officers are our heroes – we expect them to run towards a terrorist attack and take action to confront and stop that threat,” Hogan-Howe said. The announcement comes as experts claim London is not the only city at risk of a Paris-style terror attack. Chris Phillips, former-head of the National Counter Terrorism Security Office, called for more funding to ensure other major cities could protect themselves. “It does concern me a little bit that we are focusing so much on London whereas we know that the terrorist threat is actually worldwide and UK-wide,” he told the BBC on Thursday. He said the Home Office must rethink how money is allocated and warned against London-centric security arrangements. “It is the terrorist who decides where they are going to attack,” Phillips said. The Met will start internal recruiting immediately.